Who ordered the Wiener Schnitzel? We’re heading to Vienna, a city that perfectly embodies our favourite combination of old-school class and edgy youth culture. This is going to be our very first Austrian location and we plan to make a big splash with a 822-room co-living and co-working space on Nordbahnstrasse, at the heart of the up-and-coming 2nd district of Vienna. So, what’s our Austrian flagship going to look like? 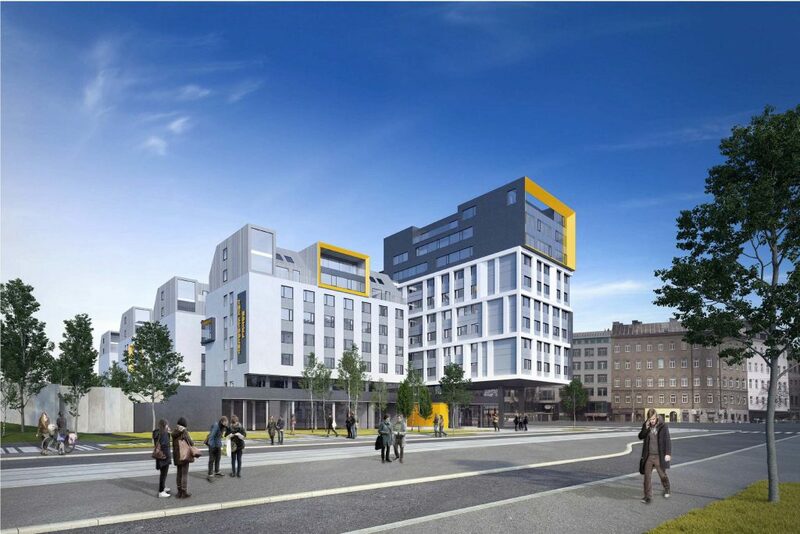 It will include our signature mix of contemporary student rooms, hotel rooms and co-living studios, plus a sprawling ground floor space for study and gaming areas, meeting rooms, restaurants, bars, gyms, and designer co-working facilities. A unique indoor amphitheatre will serve both as a communal seating area and event space, plus there will be dedicated space for local and international retail brands. Our doors will be always open to the public and local community, cause that’s kinda our thing. We’ll get cracking with the renovations at the beginning of 2018 which means we’ll be ready to welcome you with open arms in 2020! In the meantime, you’ll find us brushing up on our German. How do you say…Sachertorte?